We had the most amazing wedding. Randy did a great job and we would recommend him to anyone looking for a DJ. He was very accommodating and everything went smoothly. Randy was fantastic from start to finish! He is super accessible at all times and beyond accommodating. We had a large Greek wedding and he did a great job playing our Greek music and adjusting on the fly with day-of changes. He is extremely affordable and was worth every penny. We had a great time and would suggest him to everyone. Also, his online portal made everything leading up to the wedding simple, organized and fun. Thanks Randy!! Having Randy MC and DJ our wedding was the best decision I made! He was extremely accommodating, always responded whenever I had any questions, and made our day unforgettable. Everyone told me how much they loved the music and everyone was dancing the entire night! I highly, highly recommend Legendary Weddings and will continue to to all family and friends ! Thank you Sarah, your wedding was so fun and I'm very glad you decided to go with us over all the many other companies out there! You're what makes us legendary! Randy of Legendary Weddings was everything we were looking for, for our wedding day! He was professional but still kept it fun and kept everyone dancing! He met with us as many times as we wanted and played all the songs we had on the song list that we gave him. Thanks for helping make our day unforgettable Randy!! I don't think we could have found a more perfect DJ for our wedding this past July. Randy was organized, responsive, knowledgeable, professional, and an absolute joy to work with. The convenience of the online questionnaire and payment page was a big time saver and made our wedding planning that much easier. For two people whose "do not play" list (sorry not sorry chicken dance, P!nk, Lady Gaga) was likely even longer than the "please play" list (Justin Timberlake, Michael Jackson, Coldplay), Randy somehow anticipated just what we would like and exceeded all expectations. His set up was impressive - not at all intrusive or an eye sore. Our guests echoed all of our sentiments and really enjoyed the ambience created by his music and lighting, as well as his direction to ensure a smooth flow to the night. Look no further than Randy/Legendary Weddings! We're certainly glad he was there playing such a big role in our big day! Good music and lots of dancing were a main focus for our wedding and Legendary Weddings delivered! Randy was not only 100% professional and prepared, but he was also a lot of fun. He honored all my crazy song requests and had a smile on his face the entire night. People danced all night long!! It was definitely a major highlight of our wedding. Thanks, Randy!!! Randy is very professional, has top notch equipment, and kept people on the dance floor all night! Was totally amazing ! !went well beyond what we expected ! Thank you so much for making our wedding perfect and fun ! DJ Bitti in da house! I went to Highschool with Randy and remember his love for making people smile and music. So I may be a little biased but honestly, he's not only a great guy and super fun to work with. He's an incredible investment for your wedding. He stuck with the music we and our guests loved but also made sure to make time for a few songs that my husband and I made a pact to find each other and dance to. From meeting us to discuss the final game plan, to pumping everyone up for when we were announced. Flawless night. And here's the big one, Aaron and I decided to surprise our guests with a lipsync battle but not tell each other what songs we were doing. With less than a month until the big day, we secretly gave randy our songs and he mixed them perfectly and even ran me out my sparkly microphone when my girls and I creamed Aaron to a choreographed lip sync of Beyoncé. Simply put, just hire the man! He won't steal your thunder on the floor (although I've seen his sweet moves) but he will keep everyone excited and moving. Thank you Kristina! I was so glad to be a part of your special day and that lip sync battle was...well, legendary! Can I just saw WOW!!! Randy made our special day so incredibly amazing!! He worked with us to learn what we wanted, how our ceremony and reception was planned out and helped provide some great ideas!! He is professional, fun, carasmatic and everyone at my wedding just loved him. I gave randy a list of songs my guests requested and he played all of them, even one people requested on the spot. And more importantly he made sure the chicken song wasn't played because I really don't like it hehehe. Randy thank you for making our day so magical...full of energy and happy dancing family and amazing memories!! I know I'll be calling him for any future parties and I constantly recommend him to everyone I run into!!! BOOK HIM...YOU WILL BE SOO HAPPY YOU DID!! Randy did a better job that we could have hoped for. Perfect music and lighting. 10/10 would hire again. Randy was so pleasant to work with. He always responded quickly and worked with every request I had, whether big or small. He listened to and complimented my ideas, which I though was very respectful. I felt safe trusting him with my vision, and he totally nailed it! Actually, his skill and professionalism made my event better than I could have imagined! I highly recommend Randy to anyone in the area looking for a DJ in the area. Thank you so much for everything you did Randy! Randy was amazing! He works so hard and met each and every one of our needs! Our guests had nothing but compliments for him. He met with us twice before the wedding to make sure that we were happy. We highly recommend him for ANY event! DJ Bitti was phenomenal throughout the entire experience. He was prompt when we contacted him about pricing, met with us to go over questions and concerns, made himself available for planning, and was extremely thorough with his online questionnaire. We have friends with a very particular sense of music style, and he kept up with all of their oddball requests. I would definitely recommend DJ Bitti to a friend. He was professional, thoughtful, and made our day spectacular! And another positive -- his set up is extremely classy. You can tell he takes great pride in making sure that the DJ booth and equipment blends seamlessly into the decor and isn't an eyesore. As a picky bride in terms of aesthetics, that alone was worth it for me. Thank you Caitlin for the kind words! I'm glad your reception turned out as well as you had hoped! DJ Bitti did a great job! He was very professional and helpful throughut the entire process. We highly recommend DJ Bitti. He was very receptive to our needs for our wedding. He went out of his way to download some songs that were probably hard to find!! He was a great find. Thank you for the review Lori! He was great, did everything I asked for!! Randy was very personable w/ us and interested in making our day the way we wanted it . and I have already recommend him to a family member , who was at my wedding and thought he was amazing !!! Glad I was able to meet your expectations and thank you for referring me to others! We had the honor of being the first wedding for DJ Bitti's Disc Jockey Service. We couldn't have been more pleased with the service and professionalism Randy provided us on Our Day. 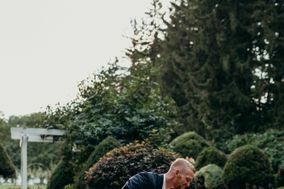 I can assure you he will make every effort to do what's needed to make your wedding just what you want it to be, or at least to sound just how you want it to sound. Rumor has it he can't control the weather. We absolutely recommend DJ Bitti's Disc Jockey Service to our closest friends and loved ones, and will use him again down the road, should we need a great DJ. this event was a formal for a college dance club Randy was able to take requests and keep all of these dancers happy! Great personality and very professional before, during, and after the event. I would not hesitate to hire him again!! DJ Bitti's Disc Jockey Service DJ'd my daughter's Sweet 16 Birthday party for four hours providing additional lights and effects. He was very accomodating and attuned to the 30 kids in attendance. They were still talking about the party for weeks after. He also did a father/daughter dance which my husband appreciated! Played my 4th of July party and I could not have been more impressed!!! Very nice equipment, played a very good mix of music and kept the party rolling. At multipule times he had the party all dancing. Even made a special mix for the fireworks!!! Highly recommend his service for any event that you want good music and a great time. He will be the Dj at any event I hold in the future.